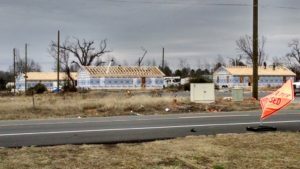 Grant funds from UMCOR and funds from the people and churches of the Arkansas Conference allowed Disaster Response Ministries to help rebuild homes destroyed by the 2014 Central Arkansas Tornado. Consider donating funds for disaster response needs to the Conference fund both in times of non-disaster and during a disaster event. Funds raised within the conference belong to the conference and are administered by the Conference Disaster Response Coordination Team in a manner consistent with United Methodist disaster response guidelines. All funds collected through the Arkansas Conference during times of disaster will be used to assist in current disasters within the bounds of the Arkansas Conference. All monies raised for disaster response and recovery will be made available for the effort until either the funding runs out or requests for assistance are no longer being received. Excess funds collected specifically for disasters within the Arkansas Conference will be used for future disasters within the Conference. These funds will not be used beyond the bounds of the conference. One exception is when a crisis of overwhelming magnitude strikes that demands a moral decision to commit funds designated for local use. This is rare and would require a reserve of funds, a recommendation of the Conference DRC Team and the express approval of the Bishop and the Cabinet. Participate in the annual denomination-wide offering taken during Lent and known as UMCOR Sunday. The offering goes to the United Methodist Committee on Relief and is the most common source of funds that allow them to provide an immediate response. This offering of undesignated funds allows a check to be issued within 24-48 hours of request after a disaster event. This offering also allows UMCOR to use 100% of designated funds to assist those affected by disaster. Designated Advances are available for UMCOR US Disaster Response (#901670) and UMCOR International Disaster Response (#982450). 100% of funds donated to the Advance are designated to assist those affected by disaster. 100% is possible due to the generous donations of undesignated funds made on UMCOR Sunday. Click here to make a donation for response to disasters.